Victoria Adelman is lonely. Her best friend has moved away, leaving her to spend the summer alone. 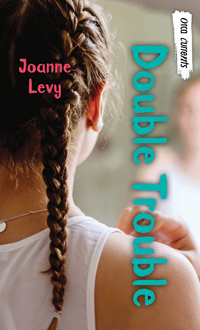 One day, on her way home from a bat mitzvah, she meets Jasvitha, her next-door neighbors' granddaughter. Tori hopes her friendless status is about to change. Later, in her garden, she meets Jasmine again, but Jasvitha doesn't recognize the filthy, smelly girl as the one she met earlier. In a moment of insecurity, Tori tells Jasvitha that the girl she met before was her twin sister, Vicky. Tori is sure she can fake being that girl in the dress—it's only for two weeks. But then Jasvitha announces she's staying with her grandparents for the school year. Tori needs to figure out what to do: come clean and lose her new friend, or live her life as a fake.